Armstrong pressure-reducing valves (PRVs) and temperature regulators help you manage steam, air and liquid systems safely and efficiently. And they ensure uninterrupted productivity by maintaining constant pressure or temperature for process control. The simplest of PRVs, the direct-acting type, operates with either a flat diaphragm or convoluted bellows. Since it is self-contained, it does not need an external sensing line downstream to operate. It is the smallest and most economical of the three types and is designed for low to moderate flows. Accuracy of direct-acting PRVs is typically ± 10% of the downstream set point. The GD-30 is a compact, high-performance direct-acting valve. Economical to buy and use, it is ideal for those low-to-moderate-flow applications where accuracy of ± 10% is acceptable. The GD-30 is well suited for laundry and dry-cleaning equipment, hospital equipment, tire molds, humidifiers, small heaters and applications in food processing. It provides tight shutoff for dead-end service on steam. 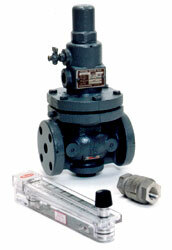 The GD-45 is a compact, high-performance direct-acting valve. Inexpensive to buy and use, it is ideal for those moderate-flow applications that do not justify the higher cost of pilot-controlled valves. The GD-45 is well suited for laundry and dry-cleaning equipment, hospital equipment, tire molds, humidifiers, small heaters and applications in food processing. The GD-10/10F is a lightweight direct-acting diaphragm valve used primarily for pneumatic tool air supply and non-hazardous gas regulation. Screwed connections make it easy to support in position without external sensing lines or other parts. Zinc or aluminum bodies eliminate rust and scale. Plug, seat and diaphragm are renewable in-line, and you can make quick adjustments externally with a locking handle. The GD-6N and GD-6 are compact, direct-acting diaphragm valves ideal for low-flow applications, including laundry/dry-cleaning equipment, hospital equipment, tire/plastic molds and food processing. Lightweight and compact, the valves require no external sensing lines or additional parts. An external adjusting screw with locking nut and cover make for quick, easy setting and adjustment. The valves provide tight shutoff for dead-end service. Valves include removable stainless steel diaphragm, hardened stainless steel working parts (6N), integral removable strainer (6N) and in-line renewable valve and seat. The GD-6N and GD-6 are available in 3/8", 1/2" and 1" (10, 20 and 25 mm) sizes, with a choice of two set pressure-range springs. An industrial-grade valve for water systems, the GD-24 is lightweight, compact and economical. The valve comes with screwed connections and will mount in any position. It requires no external sensing lines, and its bronze body and high-temperature diaphragm are suitable for hot or cold water service. The valve, seat and diaphragm are renewable in-line. The GD-24 has an external adjusting screw with lock and is available in six sizes, 1/2" through 2" (15–50 mm). The GD-200/200H valves offer high capacity and highly accurate control, with a large, cupped diaphragm for a long stroke. Compact and rugged, the GD-200's composition valve and bronze metal seat mean high performance over a longer service life. Well suited to non-viscous liquid pressure reduction, the valve is widely applied in domestic water applications, construction equipment, irrigation, tank-car loading, and industrial or commercial air conditioning. Upstream variations do not affect the balanced pressure valve, and the composition disc ensures tight shutoff. The turndown ratio is 10:1, and sizes range from 2" through 6" (15–50 mm). The GD-2000K is an ideal choice when set-point changes are frequent, access to the valve is difficult and steam quality is poor. The GD-2000K comes with either NPT or flanged connections for quick, easy installation. It also comes with a durable ductile iron body and features double stainless steel diaphragms and hardened stainless working parts, renewable in-line. High Cv and 10:1 turndown ratio. Single-seated for dead-end service. Armstrong's acoustic insulation jackets eliminate excessive noise from steam valves. Armstrong's acoustic jackets are engineered using Teflon coated fiberglass cloth with one inch thick #11 density insulation and needled fiberglass mat. Acoustical covers effectively reduce noise by about five decibels. External Pilot Solenoid Operated Valves: The GP-2000 On/Off option allows for remote shutoff of pressure reducing valves. Noise Treatment: OSHA has established limits on the length of time any employee may be exposed to various sound levels. This type of PRV incorporates two valves-a pilot and main valve-in one unit. The pilot valve has a design similar to that of the direct-acting valve. The discharge from the pilot valve acts on top of a piston, which opens the main valve. This design makes use of inlet pressure in opening a large main valve than could otherwise be opened directly. As a result, there is greater capacity per line size and greater accuracy (± 5%) than with the direct-acting valve. As with direct-acting valves, the pressure is sensed internally, eliminating the need for an external sensing line. The GP-1000 Series valves are pilot-controlled for accurate regulation of pressure under widely ranging flow. The internal-pilot design eliminates external components and piping. Internally piloted GP Series valves are capable of larger capacity and greater accuracy than direct-acting valves. Internally piloted GP Series valves are rated for dead-end service and have a 20:1 turn down ratio and an accuracy of ± 5% of set point. Completely supported by piping, lightweight GP Series valves install easily with NPT or flanged connections. A stainless steel diaphragm, hardened stainless steel working parts and integral removable strainer team up to provide higher performance over a long, trouble-free service life. Valves are equipped with a caged main valve assembly (separate shutoff surfaces and flow-control ports), piston valve rings for longer life, and an external adjusting screw with locking nut and cover. All working parts are renewable in-line. For air service, a Teflon®; seat ensures tight shutoff. In this type, double diaphragms replace the piston operator of the internally piloted design. This increased diaphragm area can open a large main valve, allowing a greater capacity per line size than the internally piloted valve. In addition, the diaphragms are more sensitive to pressure changes, and that means accuracy of ± 1%. This greater accuracy is due to the location, external to the valve, of the sensing line, where there is less turbulence. This valve also offers the flexibility to use different types of pilot valves (i.e., pressure, temperature, air-loaded, solenoid or combinations). The GP-2000 is a high-performance, externally piloted reducing valve for large-capacity requirements. Typical use is on intermittent service, including applications such as heat exchangers, steam coils, rotating dryers, process equipment and heating systems. With a 20:1 rangeability and high Cv, the GP-2000 is reliable and accurate (± 1% of pressure set point from 5% to 100% of flow) over a long, trouble-free service life. Hardened stainless steel working parts are renewable in-line. The GP-2000 is single-seated for dead-end service, and it is available with both NPT (1/2"–2") (15–50 mm) and flanged connections in 2"–6" sizes (50–150 mm). The GP-2000L is a high-performance, externally piloted reducing valve for large-capacity and low inlet pressure requirements. The GP-2000L is reliable and accurate (±1% of pressure set point from 5% to 100% of flow) over a long, trouble-free service life. Hardened stainless steel working parts are renewable in-line. The GP-2000L is single-seated for dead-end service, and it is available with both NPT (1/2"–2") (15–50 mm) and flanged connections in 2"–4" sizes (50–100 mm). The GP-2000CS is a high-performance, externally piloted reducing valve for large-capacity requirements. Typical use is on intermittent service, including applications such as heat exchangers, steam coils, rotating dryers, process equipment and heating systems. With a 20:1 rangeability and high Cv, the GP-2000CS is reliable and accurate (± 1% of pressure set point from 5% to 100% of flow) over a long, trouble-free service life. Stellited stainless steel working parts are renewable in-line. The GP-2000CS is single-seated for dead-end service, and it is available with both NPT (1/2"–2") (15–50 mm) and flanged connections in 2"–4" sizes (50–100 mm). A high-performance externally air-piloted pressure-reducing valve, the GP-2000K-1/GP-2000K-3/GP-20000K-6 is an ideal choice when set-point changes are frequent and access to the PRV is difficult. The valve comes totally assembled and requires no field installation except downstream sensing line and air connection. The GP-2000R is a high-performance externally piloted throttling back-pressure valve for large capacity applications. Typical applications would include systems using flash steam for low-pressure heating or processes. The GP-2000R valve will function to maintain a constant upstream pressure. This valve is not a safety valve and should not be used for that purpose. Armstrong self-actuated externally piloted temperature regulators are compact, high-performance units that are simple in design and operation - and suitable for a wide variety of applications. Flexible mounting positions of the sensor, interchangeable capillaries and varied temperature ranges make installation, adjustment and maintenance quick and easy. 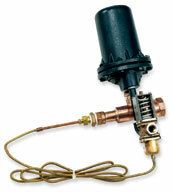 The Armstrong OB-30/31 is a direct-acting temperature regulator that requires no external source for operation. Simple and compact, the unit is suitable for a wide variety of heating/cooling applications. Installing, adjusting or maintaining the OB-30/31 is quick and easy, because interchangeable capillaries mount in any position and disconnect by simply loosening the union nut. No stem packing, so there's no leakage. Single composition seat for tight shutoff. The OB-30/31 comes in 1/2", 3/4" or 1" (15–25 mm) sizes and is available with a choice of five temperature ranges and three capillary lengths. Armstrong's OB-2000 is a high-performance externally piloted temperature regulator for large-capacity applications such as heat exchangers, steam coils, steam dryers, plating tanks and parts washers. Self-actuated and requiring no external energy source, the OB-2000 comes with main valve, pilot valve and tubing kit. Capillary units mount in any position and can be easily disconnected and interchanged, offering easy installation and maximum application flexibility. Armstrong's OB-2000L is a high-performance externally piloted temperature regulator for large-capacity, low pressure applications. Self-actuated and requiring no external energy source, the OB-2000 comes with main valve, pilot valve and tubing kit. Capillary units mount in any position and can be easily disconnected and interchanged, offering easy installation and maximum application flexibility. Armstrong's OB-2000PT is a high-performance externally piloted pressure/temperature combination regulator for large-capacity applications such as heat exchangers, steam coils, steam dryers, plating tanks and parts washers. It should be used in applications where maximum pressure should be limited and the temperature of the heated medium is controlled using a single-seated main valve. When accurate control is desired from your steam or water applications, the Armstrong Python® 1100 Series Control Valve will squeeze every bit of performance out of your system and deliver precise control. With a wide range of materials, sizes, trim, and other features, you are sure to find that the Python can accurately control your system. The Python 1100 Series Control Valve is constructed and equipped with state of the art materials. Control valves are a key component in any pressure or temperature control application. Armstrong's series 1500 valves are globe two-way single seated valves that deliver accurate and efficient control for most steam and liquid applications. Body has top entry trim and bolted bonnet to enable easy access to all internal parts for in-line inspection, maintenance, and trim replacement. When accurate control of your steam or water application is desired and air is not available, the Python AEL Electric Control Valve will deliver precise control. The electric version of the popular 1100 series control valve is built to out perform and deliver accurate control. The AEL Series Electric Control Valve is constructed and equipped with state of the art industrial materials combined with the standard 1100 series main valve. n-line (drain) separators DS-1 and DS-2 separate condensate efficiently by using the centrifugal force of steam or air created by introducing it into a specifically shaped path. Because of the simple structure of the drain separators, pressure loss is minimized, enabling clean, dry steam or air to be fed to equipment. The major cause of flooded heat exchangers is a lack of sufficient pressure differential across the steam trap under modulated steam conditions. With Armstrong's Posi-Pressure Control System, there is always a minimum preset differential pressure between the heat exchanger and the condensate-return system. Even if the pressure in the condensate return changes, the Posi-Pressure Controller automatically adjusts to maintain the preset differential. Armstrong Control Panels and Air Loaders are designed to provide the necessary air-loading signal to control any air-operated pressure-reducing valve. While designed specifically to control Armstrong pressure-reducing valves such as the GP-2000K-1, 3 and 6, and GD-2000K, these panels can remotely control other air-loaded valves. The panels are of rigid, lightweight, anodized aluminum for easy handling and installation. Panels come fully assembled with gauges suited to applications. Panel mate and panel mate filter are standard on panels and are also available separately. Typical applications for pneumatic temperature controllers include instantaneous or storage tank water heaters, air make-up units, and manufacturing process operations such as parts washing, die casting and plastic molding. A compact pneumatic temperature pilot with broad temperature ranges, the OBK-2000 can be located away from the regulator valve, an advantage not available with a conventional capillary system. Armstrong offers specialized equipment, including condensate coolers, to maximize the efficiency of your pressure and temperature control efforts and to meet required city and state codes. Armstrong's Condensate Cooler mixes hot condensate or hot water with a cold water supply to reduce the temperature to acceptable drain temperatures as required by city and state codes. It is a pre-assembled package that is suitable for any plumbing system. When hot condensate or hot water is drained into the condensate cooler body, the tempering valve opens and allows cold water to enter the chamber and mix with hotter liquid, cooling it to a preset temperature level of 135°F (57°C) or to a desired field-set temperature.